Sida 13(2): 128. 1988 , without exact basionym page. Origin and Habitat: West Texas. Brewster County, west Texas. Apparently restricted to the limestone hills near the Rio Grande, near Mariscal Mt. to Boquillas Canyon, in the Big Bend National Park, possibly adjacent Coahuila in Mexico (Northern America). Even though Opuntia aureispina has a limited range, its population is dense. Altitude range: 500-600 metres above sea level. Habitat and ecology: This cactus is found in fractured limestone of low hills. It is also fairly common on the floodplains near Boquilla Canyon. No major threats are known for this species. Opuntia aureispina hybridizes at least in part of its range with Opuntia phaeacantha (= Opuntia x spinosibacca M. S. Anthony) and Opuntia macrocentra (= Opuntia x rooneyi M. P. Griffith). 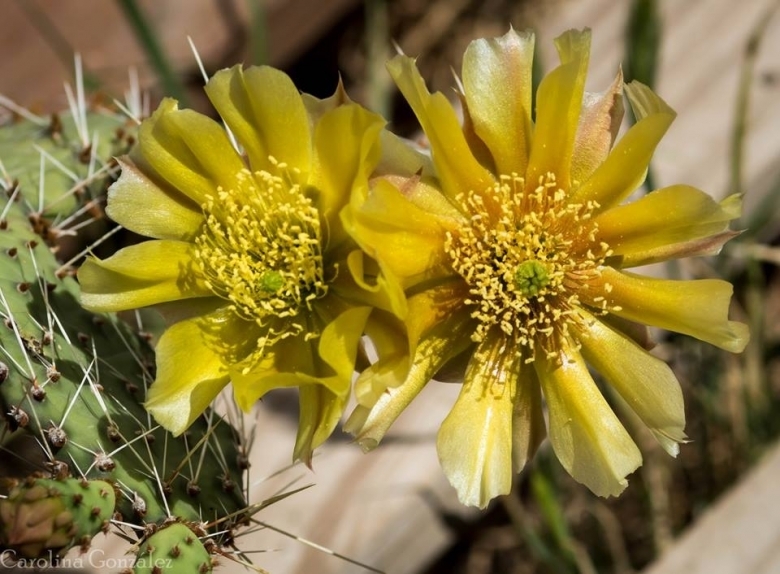 Description: Opuntia aureispina (golden-spined prickly pear) is a treelike shrub with many ascending branches near ground level 1-1.5 m tall, from short heavily spined trunks. As suggested by its common name, it posses rather long, golden spines. The spines appear more numerous and longest an upper part of pads. Opuntia aureispina can be distinguished from other prickly- pears by its spiny fruits that are fleshy at first but dry and hard at maturity, and its yellow flowers with reddish bases. This species, was discovered by the author in 1985 and described by Heil and Brack (1988). Stem segments: Joints not detaching easily, flattened, glaucous, light blue-green to yellow-green, circular to broadly obovate pads 8-16 cm long and 8-12 cm wide more or less tuberculate, glabrous. Areoles: 6-8 per diagonal row across the midstem segment, ovate to oblong, 4-5 mm long, 1-3 mm wide with brownish to black wool. Spines: 4-12 per areole, found in all areoles from upper margin to base of pad, spreading, and evenly distributed, bright yellow-orange to light brown, red brown at the base, all with yellow tips. ageing tan to nearly black, not chalky white. Central spines (1-)3-5(-6) needle-like, sometimes flattened and twisted 2-6 cm long. Radial spines 1-7 slender, deflexed, 2 cm long reddish brown at base. Glochids: Yellow, spaced in narrow row circling areoles, subapical tuft not or poorly developed, yellow, unequal in length to 5 mm long. Flowers: Yellow with bright orange or red centres, 5-8 cm long, 6-7 cm in diameter. Perianth segments yellow with an orange-red base, 3-4 cm long. Filaments yellow to pale green; anthers pale yellow. Stigma lobes pale green or pale yellow. Style yellowish or pink. Blooming season: This species is expected to bloom in spring (late March and April). Flowers open mid- to late morning, close at night, and usually do not reopen. Fruits: Ovoid, burlike, 3-4 cm long, 2-2.5 cm in diameter, beginning fleshy, quickly drying, pale green to reddish tan and hard when mature with 12-25 areoles bearing several rigid yellow spines. Seeds: Tan to light brown, flattened, irregularly shaped, 3-6 mm. 1) Heil, K. & Terry, M. 2013. Opuntia aureispina. The IUCN Red List of Threatened Species 2013: e.T151852A568721. http://dx.doi.org/10.2305/IUCN.UK.2013-1.RLTS.T151852A568721.en. Downloaded on 27 March 2016. Cultivation and Propagation: Opuntia aureispina is a much decorative frost hardy, summer grower species that offers no cultivation difficulties. Its small bluish pads provide a striking accent for an otherwise dormant cactus garden. Hardiness: It is a quite frost resistant cactus, hardy to -7° C (or less if very dry). However in cultivation it is better not to expose it to temperatures lower than -0° C, even if in an aerated and protected location, in order to avoid the formation of anti-aesthetic spots on the epidermis. In presence of high atmospheric humidity avoid any frost as it is particularly sensitive to root rot. It can handle extremely high temperatures in summer. Use: It is suitable for small “desert” gardens, in association with other xerophytes. Where the open air cultivation is not possible due to the climate, it is to be cultivated in pot in order to shelter it in winter. Warning: It is armed with treacherous glochid barbs. All prickly pears have tiny, hair-like glochid thorns in clusters on the pads. 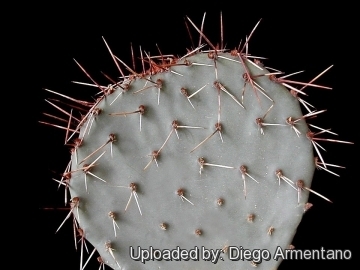 The barbed glochids cause extreme discomfort and must be meticulously removed with tweezers.